Read Across America kicked off this week and schools across the country found creative ways to celebrate reading with their students. The reading event is the nation’s largest of its kind and occurs annually on or around Dr. Seuss’s birthday, March 2 and Redskins linebacker Will Compton couldn’t wait to get started. 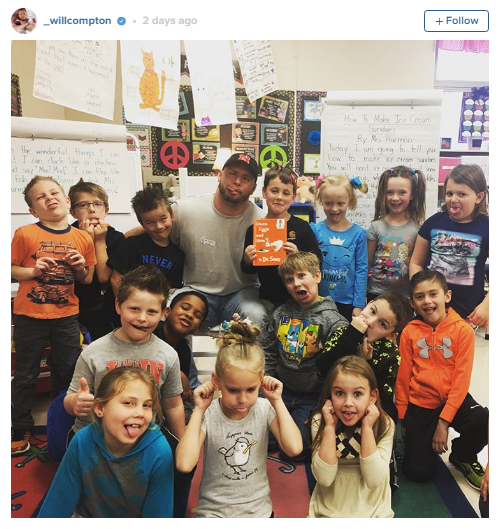 While visiting his home town in Bonne Terre, Mo., Compton made a guest appearance at a local elementary school to read to a room full of first graders. Compton took to his Instagram account Tuesday afternoon to show his support for the event by posting photos of him reading the classic Dr. Seuss’ Green Eggs and Ham as the primary students sat attentively. Making sure to add some fun to the event, Compton joined the first graders in a funny face class photo as a finishing touch.